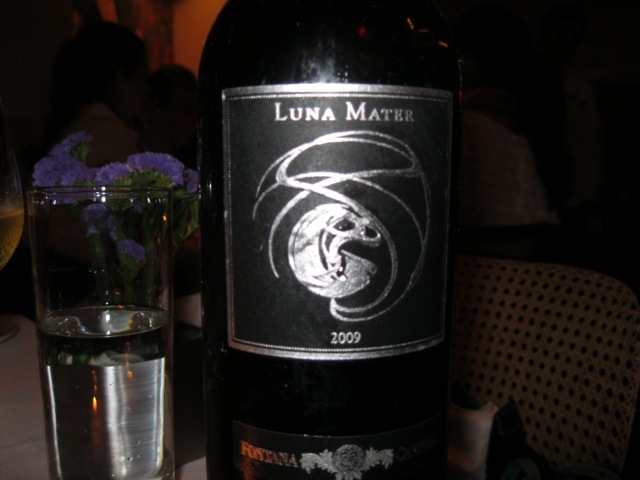 My lastest wine of the week is Luna Mater 2009 from Fontana Candida. This wine is a Frascati Superiore from the Lazio region. I had this wine last week as part of a delicious meal at the new Cafe Des Artistes. I have had many wines from Frascati and the Castelli Romani throughout the years but seldom have I had one that was so delicious. This was full bodied with tropical fruit aromas and flavors as well as great minerality and acidity which paired well with the seafood dishes that graced our table. Fontana Candida has been around for decades but many of its wines have been continually under valued and overlooked. This wine, imported by Banfi Vintners, certainly breaks the mold. Tom Hyland, a wine friend, also expressed his delight with this wine earlier this year, I was pleased to read. Tom Maresca also wrote a great piece on Frascati which you can read here as did Charles Scicolone. I’m happy to see I’m in such esteemed company in my admiration for this wine from Fontana Candida. This wine is made with a combination of white grapes including Malvasia di Candida, Trebbiano, Greco and Bombino. I would highly recommended it. It paired perfectly with both seafood and pasta. Wines from the region of Lazio have been a huge interest of mine for a number of years. Here is an article that I wrote for Alta Cucina on this very subject. Buona lettura.